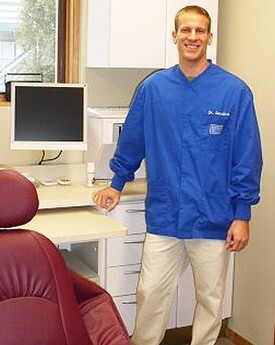 Dr. Saunders is part of a new Waupaca tradition of dental comfort and care. He is an honors graduate of the University of Illinois at Chicago College of Dentistry. He has dedicated his career to providing you with the best that dentistry has to offer. After practicing high-quality dental care in central Illinois for several years, Dr. Saunders and his family decided to move to Waupaca, where he purchased an existing dental practice in 2003. In his continuing education, Dr. Saunders is constantly educating himself and his team on the newest dental techniques to provide you with advanced, state-of-the-art, comfortable, personalized and antiseptic dental care. Dr. Saunders has completed courses in dental implant placement, cosmetic dentistry and has completed advanced training at the prestigious Pankey Institute. He is a member of the American Dental Association, the Wisconsin Dental Association and is a Fellow of the International Congress of Oral Implantologists. Dr. Saunders enjoys spending time with his wife and four children. He loves to help coach in various sporting activities & enjoys running and triathlons. Dr. Saunders has even finished the Ironman Triathlon.